It is part of the large planned urban motorway network for the city - most of which has never come to fruition. However, in common with most urban motorway schemes, if you know where to look, you can see the evidence - often in the form of "son of" routes. The short version is that it was proposed in 1963, then sacrificed on the altar of the Tyne and Wear Metro, when the new Tyne and Wear County Council agreed during their "Interim Review of Road Proposals" on 31 July 1975 (prepared April 1975) that the Central Motorway West should be placed in "Category 2". Category 2 defined as "those road schemes for which a line would continue to be protected". In English, that means "we won't build it, but we'll leave the gap in place in case we change our minds later". By the end of 1975, the Central Motorway West was dead. Well, firstly the plan called for a new Redheugh Bridge across the Tyne that would link to the southern end of the Central Motorway West. Whilst not part of the CMW per se, it was needed to replace the old bridge and was designed to flow traffic straight onto the motorway. Secondly, the junction between the Central Motorway West and Central Motorway East was completed - it's at the northern end of the CME and is laid out exactly as it would have been. The B1318 Great North Road south of that junction is massively wide and gives the game away somewhat on an aerial photo. Thirdly, the nice gap left for the Central Motorway West was finally used in the 1990s for a surface level boulevard. Find the Redheugh Bridge, and follow the route north along Blenheim Street and St James Boulevard. The route then comes to a crashing halt at a roundabout just short of St James's Park, the Newcastle United football ground. Link those two sections up, and you can see it for yourself. That passes really close to the football ground, doesn't it? I guess it would have looked pretty much like the Central Motorway East then? Although it would have been an Urban Motorway in the same way as the CME, the design was quite different. Between the Redheugh Bridge and the interchange at Haymarket, the route would have consisted of a four carriageways - the inner two taking through traffic, and the outer two allowing access to and from the intermediate junctions. The outer road would have had junctions with Scotswood Road, Westgate Road, Barrack Road and limited connections at Westmorland Road. From Haymarket northwards, it would have looked pretty much like the Central Motorway East. Can you show me the route it would have taken? 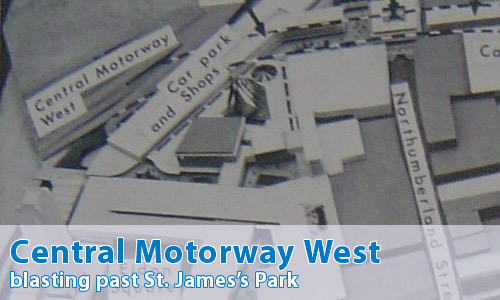 It should be pointed out that whilst you mention how close the motorway would have been to St James' Park, you didn't mention that back when the motorway was planned, St James' Park was a lot smaller than what it is now. No doubt that if the motorway was built today, you'd have to demolish the Gallowgate end of the stadium, and that wouldn't go down too well with the Toon Army! i.e. If this motorway was built, NUFC wouldn't be playing at St James' Park today. Regarding the Redheugh bridge being part of the new motorway. Coincidence or no, but when you join the bridge from the A184 roundabout on the Gateshead side, there are standard signs indicating the layout of the road and that one lane joins in, except for the fact that they are blue, to indicate motorway? Was this just a mistake or was the Redheugh bridge junction built with the intention of it becoming motorway in the near future? St. James' Boulevard was not entirely built on 'reserved' land, indeed quite a bit of demolition work was needed to get the through through there, if you look closely you can see evidence of buildings which have had one side chopped off to make room for the new road. It's good that this particular motorway didn't go ahead in my opinion, Haymarket and outside Newcastle University would have been right on the motorway, which doesn't bear thinking about.